When we're thinking of Spider-Man we're always thinking about fighting crime. We get it. With great power comes great responsibility, of course. And if it wasn't for our friendly neighborhood Spider-Man the dangerous Doctor Octopus might just be causing chaos all over the city still. The thing is, we'd like to focus on the fun parts of simply hanging out as the web-slinging boy next door. You know how you put cookies on the top shelf to stop any uninhibited sugar rushes? Well, that would do no good when your little fiend has those sweet spidery claws (what do you call those little black spikes, anyway?). Teasing siblings is going to be a whole lot of fun. That "I'm not touching you" shtick is going to be taken to a whole new level as your kiddo dangles an inch over his brother's or sister's head. You'll probably have to set some rules when it comes to playing basketball, tag, and well, any other games. The main rule being no climbing walls and no web-slinging. But then again, what's the fun in that? This costume is slick with the classic red and blue design. 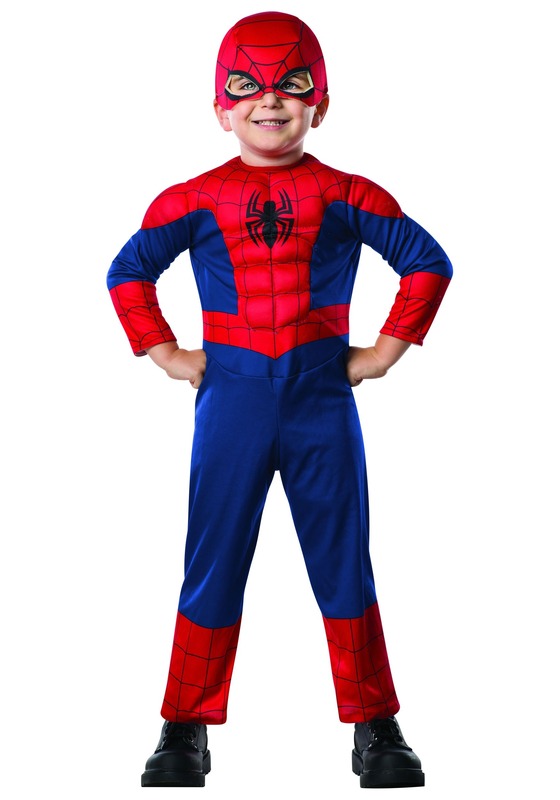 The chest and sleeves have soft-sculpted muscles to make Spider-Man look extra tough. The comfortable foam mask covers half of your kiddo's face so he can easily partake in his trick-or-treat treasures. So, maybe this Spider-Man is more mischievous than benevolent but that's what Halloween is all about, right?